- F PM 01201 C : "The Sharpie of the Culebra Cut" (Lo$#10b), from 2001, by Don Rosa (by name only). Wilbur and Orville were the sons of Milton and Susan Wright and members of a warm, loving family that encouraged learning and doing. In 1884, Milton Wright moved his family to Dayton, Ohio, the political center of the United Brethren Church. About the same time, his wife Susan fell ill with tuberculosis. Wilbur, just out of high school, put off college and nursed his sick mother. Orville began to lose interest in school and learned the printing business. Susan Wright died in the summer of 1889, the same year that Orville dropped out of high school to open his own print shop. In 1890, Wilbur joined Orville in the printing business, serving as editor for The West Side News, a weekly newspaper for their west Dayton neighborhood. It was modestly successful, and the Brothers began a daily, the Evening Item, in 1891, but they stopped a few months later.In 1894, Wilbur and Orville began repairing and selling bicycles. This soon grew into a full-time business, and in 1896 they began to manufacture their own bikes. In 1896, the newspapers were filled with accounts of flying machines. Wilbur and Orville noticed that all these primitive aircraft lacked suitable controls. They began to wonder how a pilot might balance an aircraft in the air, just as a cyclist balances his bicycle on the road... In 1905, after a series of tests, inventions, and experiments, they invented the Wright Flyer : the world's first practical airplane. In 1912, Wilbur Wright, worn out from legal and business problems, contracted typhoid and died. Orville, his heart no longer in the airplane business, sold the Wright Company in 1916 and went back to inventing. In 1948, Orville Wright died of a heart attack in 1948 while fixing the doorbell at his home. 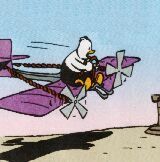 In "The Sharpie of the Culebra Cut", which takes place in 1906, Scrooge, when asked by Roosevelt what he wants to be paid with for the mountains, he first asks Roosevelts the rights on "this machine, invented by these two guys, in North Carolina", and Roosevelt answers "The Wright Brothers' Airplane?". But, before being decided, Scrooge fells in a coma because he drank "chicha", a strong Indian liqueur, and his sisters choose for him what will be the price : the first Teddy Bear.